Forgotten By His Own Desire? When Karol Rathaus died in New York nearly 65 years ago, the obituaries supposedly mentioned him as an esteemed and even beloved professor of composition at Queens College. Oh yes, he was also the author of several compositions performed in the United States. But not much was mentioned about the years before he came to the U.S. or about the offer of a teaching position 1940 at the then newly-opened city college in Flushing. For that scant information the blame belongs not only to the obituary but to the deceased himself. Allegedly, he never mentioned to his students his pre-war activities or his fame as the one of the most promising young composers active in the 1920’s and 1930’s in Austria, Germany and later in France and England. Today the music building at Queens College bears his name but his compositions are still rarely performed even though, as we witnessed during the recent Karol Rathaus Festival organized by that college, some had received American, or even world, premieres. This mini festival – two full length concerts, a lecture and a master class – was the brainchild of two Queens College professors: Dr. Edward Smaldone and Dr. Lev Deych, assisted by such noted authorities as Michael Hass and top performers as the pianist Daniel Wnukowski. One could not overlook another important participant, Dr. Leon Botstein, President of Bard College, who prepared and conducted the symphony orchestra he established and oversees at Bard called The Orchestra Now (TON) in the final concert of orchestral compositions by Rathaus. It is fascinating to delve into the rich and often dramatic life of a composer who is just recently beginning to be recognized as an American composer of Polish origin, though it was not always the case. Prior to these two concerts, the first one organized by The American Society for Jewish Music at the Center of Jewish History, and the second at the beautiful new LeFrak Concert Hall at Queens College, I had little knowledge of Rathaus’s work, having heard only the Piano Concerto and Polonaise symphonique op. 52. These two events made me appreciate this forgotten composer and be thankful that we heard his works in mostly excellent performances. The chamber music program included three original Rathaus compositions from the 1920s as well as two song cycles by two other Jewish composers related to Rathaus either by fate – Max Kowalski (1882-1956) – or in the case of the American composer Leo Kraft (1922-2014) by the fact that he was Rathaus student and later, like his mentor, also a professor of composition at Queens College. Of Rathaus works we heard the Suite for Violin and Piano (also for violin and small orchestra), the solo Piano Sonata No. 2 and the Sonata for Clarinet and Piano. During Rathaus’s lifetime the Suite for Violin and Piano (1929) enjoyed a great popularity with well-known violinists in several of the European major music centers. Unlike many of his earlier compositions, the Suite received a positive response even from critics as important as Alfred Einstein. Here we heard it with Samuel Katz, violin, and pianist Daniel Wnukowski in the first of his Festival appearances. Hearing the Suite, a work slightly less aggressive than the earlier Piano Sonata which followed, allowed us to see a subtle change of direction in the compositional approach of a composer who, as one of the most prominent students of Franz Schreker, started as a proponent of the Expressionistic School but in time moved away from its grinding, unforgiving style. It is probably unavoidable that while listening to an unknown composer or repertory, we search for comparisons, for references, with works already known. Here one could envision a Bartók influence, a little blues from Ravel or the forcefulness of the Prokofiev Sonata in F minor composed a decade later! But it is an impressive score, written with a full confidence and assurance. Needless to say, the piano part is far from being an accompaniment, as Rathaus was by all accounts an excellent pianist. The Piano Sonata No. 2, written either in 1923 or 1924, was only recently discovered in the Rathaus Archives at Queens College, where for decades it was misfiled. 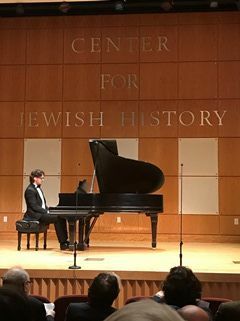 It was Daniel Wnukowski who first performed it in Europe, recorded it recently and offered its US Premiere at the Center for Jewish History, braving a piano that was not ideally prepared for the concert. But as in the previous Suite with violin, Wnukowski proved himself to be a formidable pianist fully capable of standing against the hurdles this sonata can present to any performer. The work was supposedly championed in the 20s by the eminent pianist Stefan Askenaze, who shared his Polish-Jewish roots with the composer. Set in three movements, this lengthy and densely written sonata oscillates between expressionistic “near tenderness” and angry, almost brutal rhetoric. The chordal writing dominates and there are plenty of octave runs and progressions of fourths. I was very impressed by the commanding performance by Wnukowski, who was able to get a resonant, rich sound even out of a poorly prepared instrument. One has to admire this pianist’s dedication to the music which obviously is dear to his heart. Recently Toccata Classics Records published a CD of Rathaus piano works performed by Mr. Wnukowski; that CD includes the Second Sonata, and based on what I heard during the chamber music recital – and later in the Piano Concerto – this CD will be worth exploring. It seems that Rathaus has finally found a capable, enthusiastic advocate who effortlessly can handle the demands that the composer places before his performer. The chamber music concert concluded with the Sonata for Clarinet and Piano (1928) and we were lucky to have had the indispensable clarinetist Charles Neidich and pianist Donald Pirone performing this attractive work. All I can say about Neidich masterful presentation is that if one day he’d decide to play nothing else but the scales up and down I would still consider it an event worth attending. Mr. Pirone’s presence was important inasmuch as he was the first contemporary performer of the Rathaus Piano Concerto, which he has also recorded. The Piano Concerto was the centerpiece of the orchestral concert which concluded the Festival of Karol Rathaus music. Very appropriately, it took place in the college where the composer started his American activities and it was organized by the very Music Department he built. For the program of Rathaus orchestral works, the Festival engaged not only the aforementioned Daniel Wnukowski as soloist in the Piano Concerto, but also the indefatigable Leon Botstein, who brought with him The Orchestra Now (TON) he established at Bard College as a symphony orchestra of hand-picked graduate students. That probably accounts for the generally excellent level of playing and the fact that they were able to learn and rehearse a difficult program of music that was largely performed for the very first time in the U.S. With the Piano Concerto (1939) and Symphony No. 2 (1923), we were able to determine what Rathaus music sounded like before he was forced to leave Nazi-dominated Europe, with fragments of Merchant of Venice (1936) we heard what his film-scores were about, finally with the Louisville Prelude (1953), we witnessed how much his compositional style has changed toward the end of his life. Of all those scores, I was acquainted only with the Piano Concerto, a performance of which I heard in Europe during the summer of 2018. But hearing a real pianist who can conquer the demands of the difficult piano part, changed my initially half-hearted opinion of the work. It is interesting that when it was first introduced in the United States, it garnered enthusiastic reactions from Ernst Krenek (whose own style of writing was much more acerbic and geared toward twelve-tone) and later by Darius Milhaud and even one of the San Francisco critics who, although recognizing the gloomy quality of the score composed in London in 1939, declared he “should not be surprised if the Concerto someday takes its place in the standard repertory.” Well, it didn’t, and one must be grateful for the perseverance of pianists like Wnukowski, who deem it worthwhile to invest their energy, ability and talent and faith in that music. Listening to the previously unknown score, one speculated once again about the influence of other composers. There were strong echoes of Bartók not only in the chordal writing but also in the melancholy, lyrical opening of the second movement, which is probably most impressive for its mysterious character. With its aggressive and forceful elements this score still has plenty of moments of mystery and romantic zeal. I was impressed not only with the authoritative presentation of the piano part but also with the level of orchestral playing, well-prepared and conducted with a sure hand by Maestro Botstein. Upon first hearing, also the first U.S. hearing, of the Symphony No. 2 in four interconnected movements, whose premiere caused a strong criticism and voices of disapproval from the German critics, this reviewer was not totally sold on the work, though subsequent hearing of the recording helped a little to understand this heavy influence of the Expressionist style. Unrelenting gloom and an ominous, pervasive character make it perhaps easier to admire than to love. How far our composer removed himself from the style of his younger years was demonstrated best in the 14 minutes long composition called Louisville Prelude, his last orchestral work which after its 1954 premiere was never again performed in the U.S. Here the writing is far less dense, the individual wind instruments have some prominent lines and one can enjoy the interplay of strings and winds. The music is only mildly dissonant and one can hear clear echoes of both American composers of the era (Copland, Sessions, Hanson) and later, in the polyphonic segment, also of Hindemith whose music Rathaus supposedly detested. The instrumental playing by TON was exemplary in the Louisville Prelude and all throughout the concert, and we should all be grateful that Maestro Botstein got involved in the Rathaus Festival. For years his pet projects were unjustly forgotten composers; Rathaus is definitely one of them. In conclusion one may ask who is to blame for the neglect of a composer who in his young years was widely performed by the greatest musicians of the era and who seemed to have a bright future? When one reads about his history and the fact that he was one of many Jewish composers of that era who had to leave Germany just before the outbreak of the World War II, one might blame Hitler entirely. But that would be only a partial explanation, as many of these exiled composers and performers found success in the United States, where Rathaus lived the last 15 years of his life. The main reason for the neglect was that Rathaus seemed to be ambivalent about his own works. Supposedly happy and well-adjusted, he never discussed with his adoring students his life in Europe. One must remember that Rathaus was thrown out of Germany just as he was entering his most successful and important years as a composer. In terms of his development, he was cut off at the knees. In addition, his inability or lack of ambition to belong to one school or another; his wish to be modernist without necessarily being modern and his ambition to write music that was easily taken up, followed and understood by an intelligent listener, placed him in a position whereby he was too modern for conservatives and too conservative for experimentalists. New York audiences will have one more chance to hear Karol Rathaus’s piano compositions when Mr. Wnukowski returns in May 3, 2019, to Weill Recital Hall at Carnegie Hall with a program that includes the Sonata No. 3. Wnukowski has already recorded a CD devoted entirely to the piano works of Rathaus. 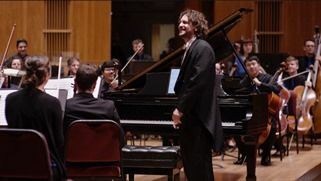 The New York performances at the Festival having further demonstrated that he is a formidable pianist, it seems that Karol Rathaus has found a brilliant new champion.